A New York City jury cleared him on five other counts after five days of deliberations. Shkreli, 34, was branded "the most hated man in America" in 2015 when his firm hiked the price of a medication used by Aids patients. 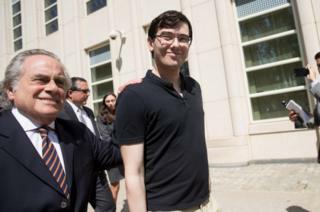 FBI investigator William Sweeney praised the conviction saying that Shkreli had "misled investors in his self-indulgent scheme". Shkreli rocketed to notoriety in 2015 after raising the price of a lifesaving anti-parasite drug called Daraprim by 5,000% upon acquiring rights to the medication. Overnight, the price of the drug soared from $13.50 to $750 per dose. "Sometimes, people's skills don't translate well," he told reporters, adding that his client suffers from "an image issue". One investor had testified that Shkreli reminded him of the autistic savant played by Dustin Hoffman in the movie Rain Man. His attorney quoted a Lady Gaga song title in telling jurors Shkrel "was born this way". He often appeared to relish in the negative publicity he received. Mr Shkreli, 59, who is accused of money laundering, told reporters about his younger doppelganger: "I don't need that kind of fame."